Thanks to our Kickstarter campaign, we now have plenty of these boards in stock. We are now accepting orders of the kit and will ship it along with Kickstarter fulfillment. 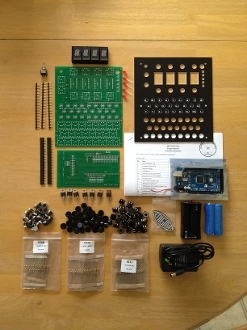 This Kit includes all the Electronic components that are required to make an Enigma similar to the one pictured above. No wood is included. No Plugboard as this is optional. Plugboard functionality in Software only. Refer to picture above to see what an assembled kit could look like. Please note the kit in the picture above uses Lampfield (blue led) buttons which have been replaced by white LEDs & a keyboard filter for a more accurate replica.